When I was in seminary, my spiritual director gave me a book by Cardinal Van Thuan of Vietnam. Rarely has one relatively short book changed me so much or had a lasting impact as this one did. The book is called The Road of Hope: A Gospel from Prison, published in 2001. It chronicles Cardinal Van Thuan’s ministry as a priest and eventually a bishop. He became the bishop of Nha Trang in 1967. Shortly after it was announced that he was to become the next archbishop of Saigon, he was arrested in 1975 by the communist regime and held in a prison for 13 years, 9 of them in solitary confinement. One wonders how someone could possibly survive all that? “Were you able to say Mass in prison?” is a question I have been asked many, many times, the Cardinal said. And when I say “Yes,” I can foretell the next question, “How did you get the bread and wine?” I was taken to prison empty-handed. Later on, I was allowed to request the strict necessities like clothing, toothpaste, and other bare essentials. I wrote home saying “Send me some wine as medication for stomach pains.” On the outside, the faithful understood what I meant. They sent me a little bottle of Mass wine, with a label reading “medication for stomach pains,” as well as some hosts broken into small pieces. The police asked me: "Do you have pains in your stomach?" “Yes,” I replied. “Here is some medicine for you!” the guard growled as he tossed me the small bottle. I will never be able to express the joy that was mine: each day, with three drops of wine, a drop of water in the palm of my hand, I celebrated my Mass. The six Catholics in my group of 50 prisoners tried to stay together. We lined up the boards we were given as beds; they were about 20 inches wide. We slept close together in order to be able to pray during the night. At 9:30 every evening when lights out rang everyone had to be lying down. I bent over my wooden board and celebrated Mass, by heart of course, and distributed Communion to my neighbors under their mosquito nets. We made tiny bags from cigarette paper to protect the Blessed Sacrament. Pains in the stomach… Think of all those pains in our “gut”, in our heart we experience day in and day out. Maybe its struggles at home, or addiction, or estrangement. Maybe it’s financial problems or difficulty at work or difficult diagnosis. Maybe it’s having a hard time figuring out what the next step in our lives is, with school or our profession. Or maybe it’s just feeling deflated, hopeless and anxious about what lies ahead. God gives us the medicine for our ailments, for the pains in our gut. He gave it to us – to the world – at the moment when we would need it the most: the night before he died for us. We celebrate this Solemn Feast of Corpus Christi, the Body and Blood of Christ, because simply put: one day, notably Holy Thursday, cannot contain the immense depth of this profound mystery that is the Eucharist. The Eucharist isn’t just any remedy – it’s actually the Physician himself! It’s not a prescription for a pill or a treatment that we get a clinic. No. The Eucharist is Jesus Christ, the Divine Physician, coming into our lives. We are nourished, strengthened and aided by the Body and Blood, Soul and Divinity of Jesus himself who desires to alleviate all that brings us grief and discouragement. Cardinal Van Thuan knew this well and desired so earnestly to get that small bottle of wine and bits of broken bread so he could take his divine medicine. This feast affords us the opportunity to reflect on a fundamental question: how do I receive the Eucharist? Do I “get” it or do I just drift by and see it as something “the priest does?” Am I eager for Mass or is it a chore? Do I encourage others to attend Mass and ensure that my family does? Do I receive reverently, remembering the sacred gift being given to me? Do I take time to pray before and after Mass, that is, to prepare my mind and heart for the Eucharist and spend some moments afterwards thanking God for this gift? 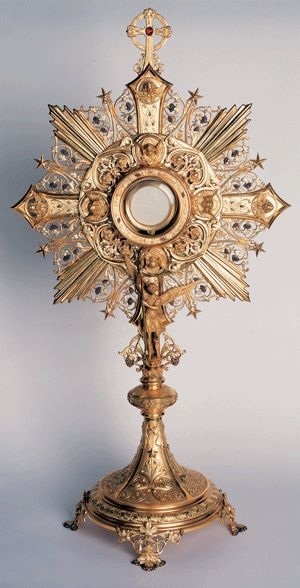 Do I recognize myself, and others, as tabernacles containing the Eucharist? Corpus Christi is the conclusion of a trifecta of feasts – Pentecost two weeks ago, Holy Trinity last week and today’s celebration. We are called to live in the power of the Spirit, to be caught up in the love relationship that is the Trinity and we do all of this by being nourished by nothing short of God himself as we receive the bread of angels. The Eucharist embodies everything that Jesus did for us and everything that Jesus is for us. It is the mystery of faith that gathers together Jesus’ teaching, his Passion, his Resurrection and his pledge of eternal life to us. If we stay close to the Mass, we will never drift far from the Lord. That is exactly what Jesus intended. Friends, all of us have stomach pains, pains deep within our bodies, minds and souls. But thanks be to God that we have a Divine Physician who comes to us and heals us from the inside. Let’s remember that the next time we go to Mass and receive the Eucharist. Let’s remember to take our medicine.